Ever since American late night talk show host Conan O’Brien announced he would be coming to Japan to visit Conan Town, we’ve been counting down the days to his arrival, eager to see what type of shenanigans he would get up to during his stay. 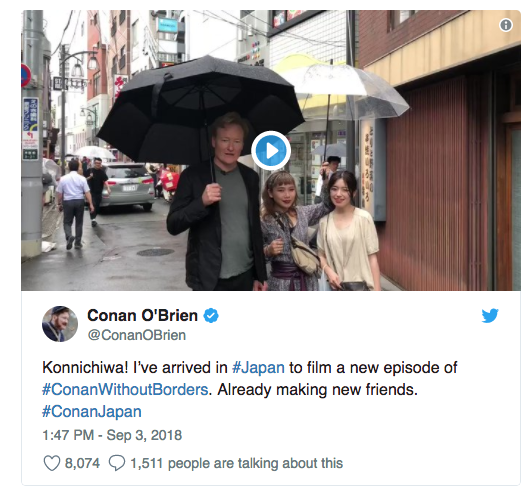 As it turns out, we didn’t have to wait long as Conan wasted no time in heading out to meet the locals on his first day in Japan, and his first port of call was Tokyo’s fashionable Harajuku district, where he made friends with the locals and filmed this short clip for his 28.5 million followers on Twitter. Not long after posting this message to his fans, and to his friends in Tottori Prefecture’s Conan Town, who are bracing themselves for the approaching typhoon, the talk show host suddenly appeared in a more colorful outfit. 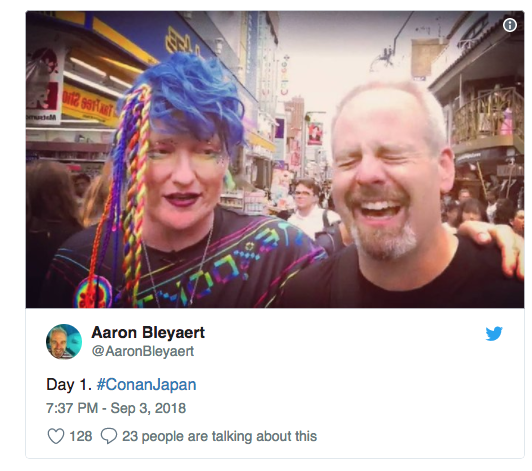 Aaron Bleyaert, known for playing video games on TV with Conan during the show’s “Clueless Gamer” segment, also films Facebook Live videos when Conan travels abroad. 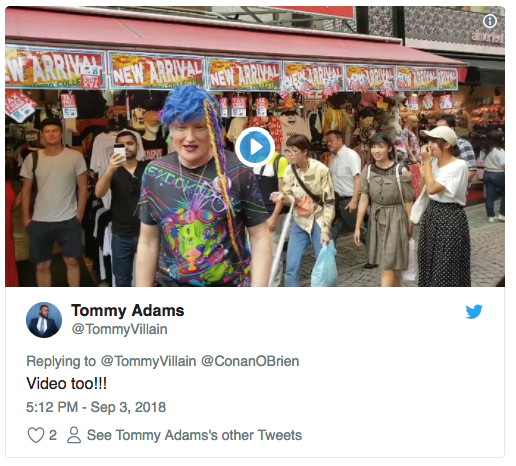 On Monday, he filmed a new video showing Conan and his team navigating Harajuku’s notoriously crowded Takeshita Street. As well as rubbing shoulders with Japanese locals, Conan bumped into some fans from around the world during his stroll through the district. 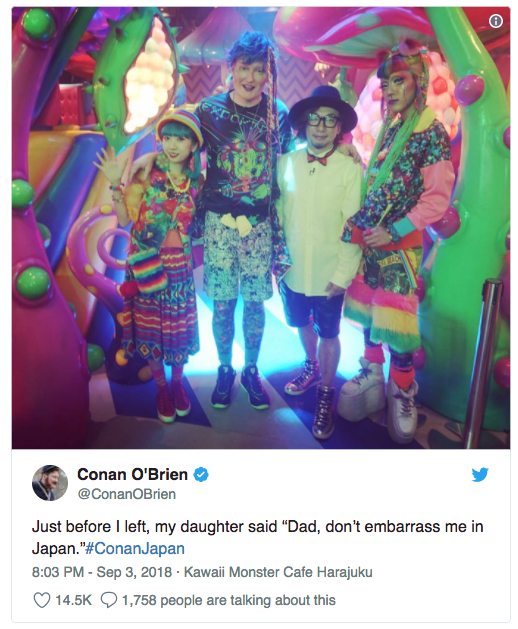 After stopping to take photos with fans, Conan then met up with some of Harajuku’s most colorful fashionistas, who took him to the Kawaii Monster Cafe nearby. ▼ Pictured below, from left to right: Miochin, Conan, Sebastian Masuda, and Kanata. While Conan was keen to immerse himself in Harajuku’s kawaii culture, this is just the start of many adventures for him and his team, who are due to visit the mayor of Hokue to collect their $3 trillion later this week. Let’s just hope the approaching typhoon doesn’t get in their way. Hey, he wasted no time! That sure was fast. From fooling around with Mayor Matsumoto on Twitter to booking a flight and landing here. Conan is awesome. I can’t wait to see what comes out of this trip. I think this has been in the works for longer than that. I'd be very surprised if the mayor of Conan Town (which has nothing to do with Conan O'Brien) just happened to be watching Conan's show one night. I could be wrong of course. It'd make a better story. Halloween come early this year? He’s hilarious. He previously went to Korea and the videos were great. I’ve been a fan of his since he was writing for the simpsons in the late ‘80s (maybe early ‘90s). I loved how weird he made the Korean trip, Germany is great too, looking forward to seeing the Japanese result.